Signed and dated WB p./1793 on the tree trunk. Stretcher stamped F. Leedham Liner, indicating a date c.1880. 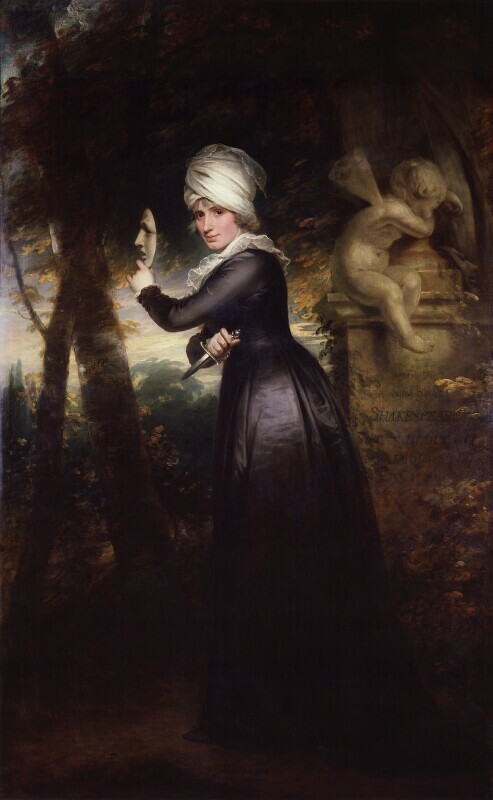 Beechey’s portrait conveys Mrs Siddon’s eminence as a Shakespearean tragedienne through emblem rather than attitude or performance, thus contrasting with the great Reynolds whole length of 1784. It was criticised at the RA in 1794 by Pasquin: ‘the attitutude is affectedly disgusting. It conveys the semblance of a gipsy in sattin, disporting at a masquerade, rather than the murder-loving Melpomene. As a portrait the figure is too thin for the original ...’. Ironically NPG 5159 came to bear an attribution to Reynolds between 1878 and 1894 which was dismissed by Graves & Cronin in 1900. 1) Quoted by W. Roberts, Sir William Beechey RA, 1907, pp 45-46. 2) J. Steegman, Portraits in Welsh Houses, II, p 125, no.5. Possibly the small copy of Mrs Siddons as the Tragic Muse sold Christie’s, 26 May 1821, lot 17. R. Asleson ed., A Passion for Performance, Sarah Siddons and her Portraitists, exhibition catalogue, Getty Museum, 1999, pp 75-76. A. Graves & W. V. Cronin, A History of the Works of Sir Joshua Reynolds, 4 vols., 1899-1901, III, p 900. W. Roberts, Sir William Beechey RA, 1907, pp 45-46, 266. Dark brown eyes, grey powdered hair, highly coloured complexion; a dagger in her right hand, a tragic mask in her right; wearing a black dress, a white turban topped with lace, white frilled muslin collar; a grieving putto sits on the pedestal inscribed: Shakespeare/Dedit/Loqui. Artist’s sale, Christie’s, 11 June 1836, lot 67, bought in; studio sale, Rainy’s, 19 July 1839, unsold; the 4th Earl Brooke(1818-93) by 1860; Trustees of Lord Brooke’s Settlement sale, Christie’s, 22 March 1968, lot 75; Dr D. M. MacDonald, by whom presented 1977. RA 1794 (127, 'Mrs Siddons with the Emblems of Tragedy'); British Institution 1860 (121) and British Institution 1867 (139), lent by the Earl of Warwick; RA 1878 (229, as Reynolds); Royal House of Guelph, New Gallery, London, 1891 (354, as Reynolds); Fair Women, Grafton Gallery, 1894 (79, as Reynolds? ); The Collection of Dr D. M. Macdonald, Leggatt, 1970 (1); Regency Portraits, Kenwood, 1986; Art on the Line, Courtauld Gallery, 2001 (64).